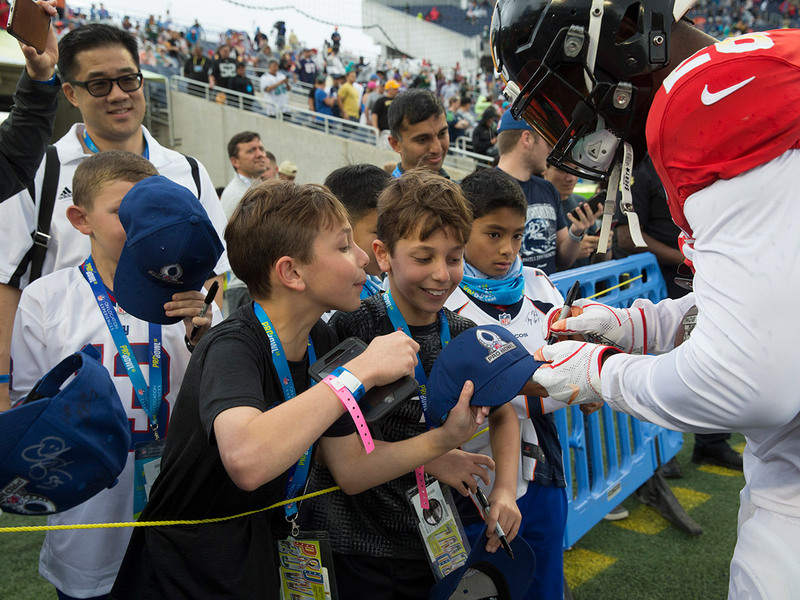 The 2019 Pro Bowl experience for NFL On Location guests was one to remember, and fans were able to get up close and personal with players, coaches, cheerleaders and mascots. Our guests had access to all-inclusive food and drink before the game, and located just a few feet from the NFL On Location tent was the red carpet where players and coaches made their entrance to the home of the 2019 Pro Bowl, Camping World Stadium. Special guest Phillip Lindsay of the Denver Broncos judged fellow players’ outfits as part of the first-ever Pro Bowl Fashion Show and fans were treated to extended appearances by Patrick Mahomes of the Kansas City Chiefs, Dak Prescott of the Dallas Cowboys, George Kittle of the San Francisco 49’ers, Myles Garrett of the Cleveland Browns and Cameron Jordan of the New Orleans Saints, just to name of a few. In addition to the players strutting their stuff and high-fiving guests on their walk into the stadium, On Location VIP’s posed for photos with NFL Cheerleaders and Mascots all while listening to unique player interviews. The AFC topped the NFC in the game, winning by a final score of 26-7. Mahomes was named the Offensive MVP, and the Jets’ Jalen Adams was named the Defensive MVP. Many guests chose to make it a full weekend, taking advantage of On Location’s one-stop-planning with fantastic first-class lodging at the Wyndham Grand Orlando Resort and transportation to Pro Bowl Week events at ESPN’s Wide World of Sports in addition to the game itself. The 2019 Pro Bowl was a success for NFL On Location guests, and we are looking forward to providing our guests with many more once-in-a-lifetime experiences throughout the rest of 2019 and beyond.